Turbo, Sasha, and Holly posted about their personal slogans as generated by the Slogan and Movie Quote Generator. We decided to go see what our slogans would be, so here they are! My slogan is "And All Because The Lady Love Steve". This is so appropriate because all the ladies do love me. My movie quote is “Show me the Steve!” I think that is a good quote for me because it just sounds tough and that’s me! My slogan is "The Right Kat at the Right Time". I agree! First off, I’m the only Kat I know, so I must be the right one and it’s always the right time to pet me! My movie quote is “We'll always have Kat.” All I have to say about that is I certainly hope so! My slogan is "Stop! This Wilbur is not Ready Yet!" I think that pertains to that people need to STOP petting me except when I want it. If I want you to touch me, I will come up to you and allow you to touch me. Otherwise, I’m not ready yet and I will bite you. My movie quote is “Everybody! Everybody wants a piece of Wilbur!” So true. Everybody wants me. I am the world’s coolest cat. PS. Thanks to everyone who has sponsored us in the Blogathon! We've got pledges totalling almost $250 now! We're really excited because we were hoping to raise $500 for Adopt a Husky of Dallas and now we're on a good start! If you still would like to sponsor us, click on the link at the top-right of the blog. PPS. 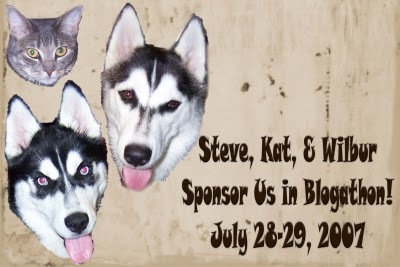 We forgot to mention another husky who is blogging for an animal shelter in Denver during Blogathon. His name is Tucker and we're sure his blog will be very entertaining during the Blogathon. Go check it out!